OK, I have a good excuse for missing this film when it hit the theaters… my birth was still 17 years out. I have less of an explanation as to why I didn’t run across it sometime during the next six decades: It wasn’t until 2009 and a conversation I had with Dom Flemons of the Carolina Chocolate Drops that I became aware of this film. Dom was enthusiastic about the story and the music performed in the movie. After describing a couple of the scenes to me he said “here, take a look” and pulled a portable DVD player and a DVD out of his backpack. We looked at several scenes, just enough to ensure that as soon as I got home I would log onto on my computer, pull up Amazon.com and throw down $12 for a copy of Hallelujah. Watching the film a week later I was not disappointed… in fact, I was delighted. at the end of this blog. Before we go any further, I need to issue a caveat… this movie about blacks in the South was released in 1929, deep in the decades of racist Jim Crow America and although Texas-born director King Vidor’s intentions were good in this first-to-be-released, all-black-cast movie, try as he might stereotypes abound, and the realities of Jim Crow America are reflected in every frame of the movie. 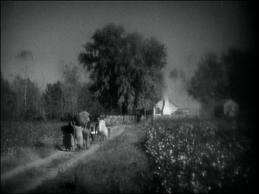 There are no white faces to be seen in this film, anywhere, ever… this may be Vidor’s way of side-stepping any racially charged interactions, but whatever the motivation this movie is about African-Americans and the black folks in Hallelujah, at least those living in rural areas, seem to be living a fairly idyllic life. They are making a crop and being paid fairly for it, they have strong family bonds, celebrate life with music and are spiritually immersed in their church, their culture and their land. Problems arise only when the rural folks run up against the black criminal element in town. These southern blacks are portrayed as fairly simple folk, motivated mainly by their emotional and physical needs. I understand that for some readers these shortcomings might dampen your desire to watch this unpolished diamond-in- the-rough film… if that’s the case this is not the movie for you. 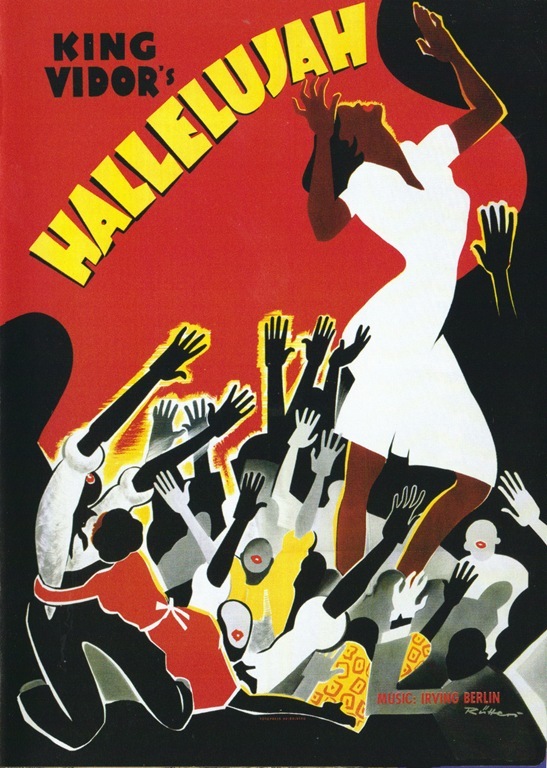 That said, for those of you willing to continue: Hallelujah is an engrossing story, with plenty of interesting vernacular music, engaging characters and it offers a glimpse of rural, southern, pre-WWII black America that is both entertaining and instructive. On its release, praise came from no less an afro-centric writer than W. E. B. 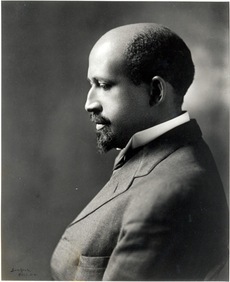 Du Bois who said of the movie: “It offers a sense of real life… everyone should see Hallelujah.” It must be noted that Du Bois assessment of Hallelujah was not universal in the African-American community. I believe Hallelujah is great storytelling. It is a classic morality saga… with great music to boot. Taking his families cotton crop to market, eldest brother Zeke falls for a beautiful cabaret dancer/singer, Chick, but she’s only a shill, enticing him into a crooked crap game. He loses all the cash he was paid for the sale of his families cotton, and to make matters worse, Zeke’s brother is killed in a shoot-out as Zeke struggles with Chick’s accomplice to regain the family cash. Following his brother’s death, Zeke has a spiritual awakening, being reborn as Brother Zekiel the evangelist. Zeke, with his family in tow, tours the countryside preaching at revival meetings — where he once again runs into Chick — initiating a romantic/spiritual push/pull of biblical proportions. These struggles carry us through to the bitter-end consequences of temporal lust and the ultimate salvation of good over evil . The story weaves family, love, obsession, guilt, redemption, violence, music, religion and a good chase scene into a time capsule of southern African-American life in the late 1920s. The story is supported by a musical lead cast as well as the Dixie Jubilee Singers and others who perform jazz, blues, folk songs, work songs and spirituals throughout the film. There is scarcely a scene which does not include vernacular music of the period. 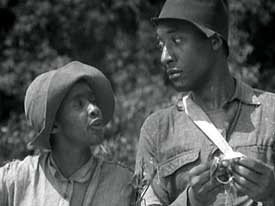 Zeke (Daniel L. Haynes) and Missy Rose (Victoria Spivey) take a break in the cotton fields. It was virtually not shown or seen south of the Mason-Dixon line, cutting out a huge portion of the potential audience. It was too risqué for the churchy folks and perhaps too churchy for a secular audience. There was little appeal to the predominant white culture and the movie was not booked into small northern towns. 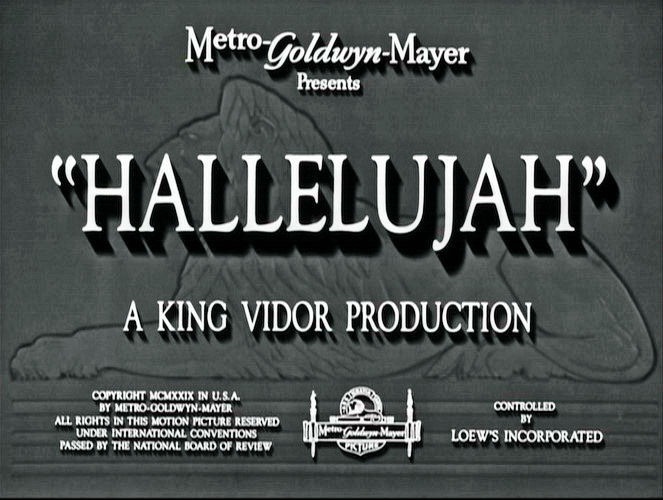 Hallelujah was released just two months before the stock market crash of October, 1929. Much of Hallelujah was shot on location in Arkansas and Memphis… giving parts of the movie an almost documentary flavor. It would be wrong to think of this as a musical, in the current sense of the term, rather, it is a movie which emphasizes music (as well as family and faith) as important cultural facets of African-American life. 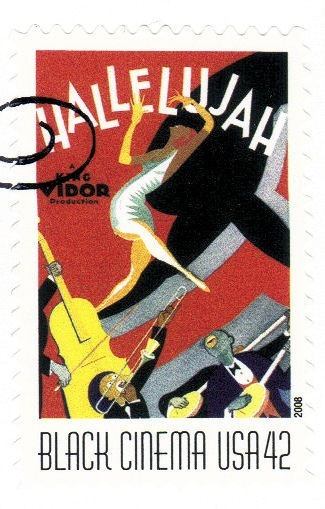 2008 United States postage stamp and first day cover celebrating Hallelujah and Black Cinema. The lead cast was carefully chosen, primarily from black New York theater performers. Film acting was new for this cast and there is very much a “staged” feeling to the acting and dialogue. That said, the characters, though often portrayed somewhat simplistically, are engaging and for the most part fun to watch. “Extras” used liberally throughout the film add a level of credibility and enhance the setting and the documentary feel of the movie. It was fun to see a jug band as portrayed as a realistic entertainment unit, playing for tips at harvest time… much as we know they did during the first half of the Twentieth Century. 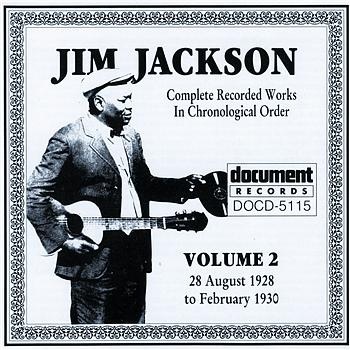 The band consists of the Dixie Jubilee Singers…banjo, three jugs with the vocal by Zeke. They do a nice job with Irving Berlin’s The End Of The Road. For those who may characterize this pop tune as inauthentic… I would invite them to check out the Dallas String Band performing Chasing Rainbows or I Used To Call Her Baby. String bands often performed popular tunes of the day, but they seldom recorded them. When recording, the record company men wanted songs they could copyright and thus better control the publishing rights. But when performing, musicians happily played what the listeners wanted to hear — and that invariably included pop tunes. And please remember, after all, it is a commercial movie and the name Irving Berlin on the advertising was sure to pull in customers. 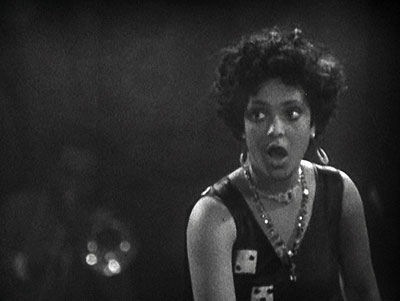 And then there is Nina Mae McKinney. She is terrific throughout. In this, her first role in front of a camera, she sings, she dances, she acts, and she’s just as cute as can be… full of moxie, pluck and spirit. Vidor found her in New York, a dancer in the chorus line of the play “Blackbirds.” Her dancing to the tune “Swanee Shuffle” is, by itself, enough reason to see the film. It’s difficult to believe, she was a mere 16 years old when Hallelujah was filmed! Perhaps the high spot of the film is the cabaret scene featuring several songs by Curtis Mosby and his Dixieland Blue Blowers. The scene has an authentic flavor, the band is great… Mosby’s drum work is not to be missed and Nina Mae McKinney’s vocals and footwork are fine. 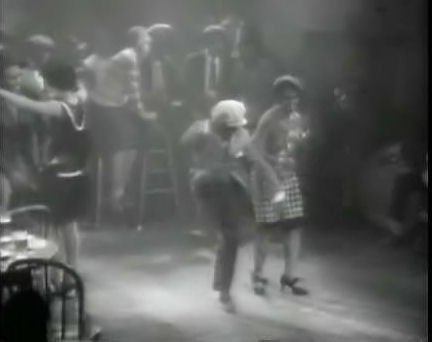 Cabaret scene, includes Swanee Shuffle. Irving Berlin’s “Swanee Shuffle,” and “Waiting at the End of the Road” are well integrated into the score and seem credible in context. Curtis Mosby’s Dixieland Blue Blowers performance of “Swanee Shuffle” and “Blue Blower Blues” (and background tunes) are indispensable. Other songs include a chorus or two of “Georgia Camp Meeting” on banjo and kazoo, field hollers, moans and work songs, an a cappella “St. Louis Blues” by Chick, a banjo breakdown with great tap dancing by Zeke’s young brothers and Mammy singing a fine rendition of the lullaby, “Hush-a-bye (All The Little Horses).” As is typical in movies, while some numbers are rendered complete, many of the songs are fragmentary or are heard in the background for ambiance. Several well known and recorded musicians are reported to have had larger or smaller parts in the film. These include Gus Cannon, Jim Jackson, Victoria Spivey, The Dixie Jubilee Singers and Eubie Blake. Spivey is easy… she has a credited role throughout the film as “Missy Rose” the good, pure country girl who is the rightful heir to the affections of the lead character Zeke. Unfortunately, Spivey’s abilities as a songstress are not on display here, hers is purely an acting role – despite having released more than twenty 78s before appearing in Hallelujah. Eubie Blake is easy too… he doesn’t appear in Hallelujah but he and his band are featured in Pie, Pie Blackbird, one of the two shorts included as an extra feature on the Hallelujah DVD. 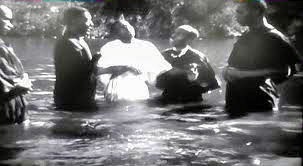 The Dixie Jubilee Singers are evident in multiple scenes throughout the film and add an authentic flavor to the proceedings, as do the extras employed form a local Tennessee Baptist church. 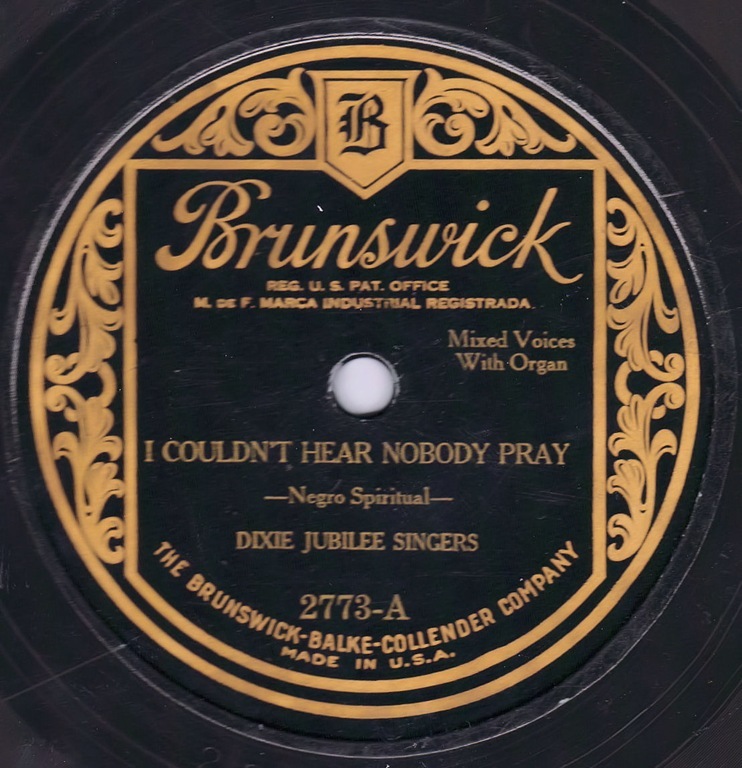 Dixie Jubilee Singers were well recorded before Hallelujah. 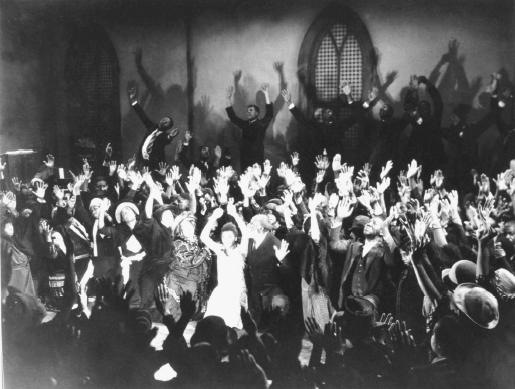 The 78, I Couldn’t Hear Nobody Pray, is from 1924. Finding Gus Cannon and Jim Jackson in the film is problematic. 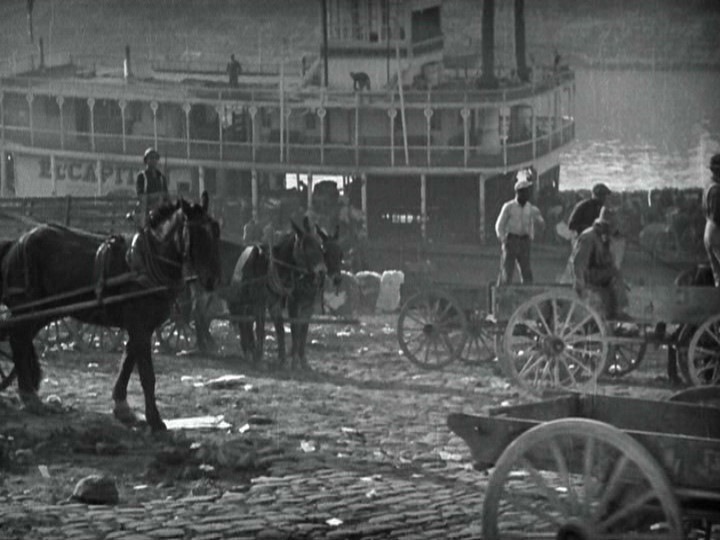 There are literally hundreds of extras in the film, and Memphis (home to both Cannon and Jackson) was one of the locations where Hallelujah was filmed. It is “common knowledge” on the internet that Gus Cannon and Jim Jackson are in Hallelujah, but watch as I might – and I know what they both look like – I can’t identify either of them. There is a banjo player in the film appearing before and during a wedding scene, who is reputed to be Gus Cannon — to my eye it’s not even close, this is not Cannon. As for Jackson, he could be anywhere in the movie – or nowhere. 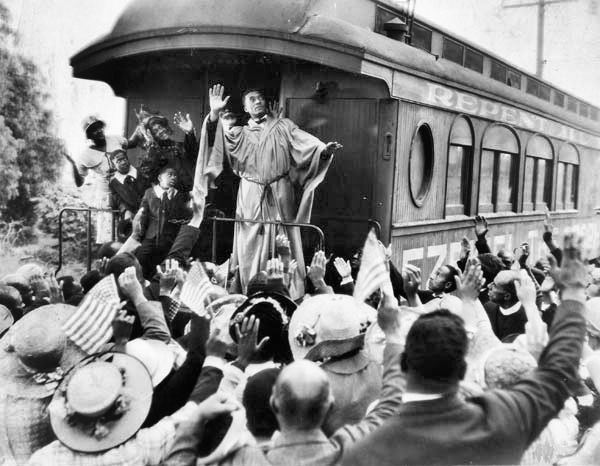 But in his case we do have corroborating evidence of a connection to Hallelujah, in the form of a photo of Jackson meeting with King Vidor and exchanging(? )a 78 rpm record! 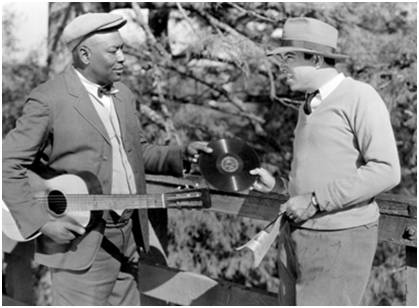 Jim Jackson and King Vidor holding 78 rpm record. Cropped photo appears on Document Records CD, DOCD-5115. The above musicians aside, I believe there’s one more well known musician who appears in the film… and this is a sighting which, to my knowledge, has not been reported previously in any media: If I’m not mistaken… and I don’t think I am, Frankie “Half Pint” Jaxon has a bit part in Hallelujah, and comes close to stealing the cabaret scene. By 28:20 Jaxon’s film career was pretty much over… his October, 1929 appearance in Duke Ellington’s short film, Black and Tan Fantasy, (wearing the same cap) notwithstanding. The movie, as reissued on DVD is, visually, a pleasure to watch. One could argue that some scenes are a touch dark, scratchy or (rarely) fuzzy – but for me that only adds to the feeling that I’m watching something special from the archives. Much like listening to a 78 rpm record, the patina of age enhances, rather than detracts from the total experience. The picture as seen on the DVD is, over all, much superior to the YouTube clips and photos included here. 1) The full feature length commentary, provided by Donald Bogle (primarily) and Avery Clayton is most noteworthy. Their commentary is a fact-filled look at Hallelujah which provides an interesting perspective on the film and its place in history, some 80-plus years later. 2) Musical short feature #1: Pie, Pie Blackbird 1932, 10:40 Eubie Blake and his band, featuring Nina Mae McKinney and The Nicholas Brothers. 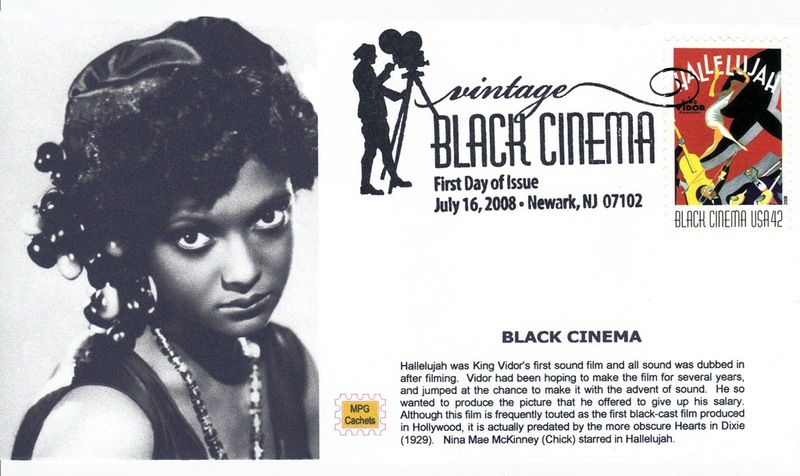 3) Musical short feature #2: The Black Network 1936, 21:05. Nina Mae McKinney, The Nicholas Brothers, The Washboard Serenaders, Babe Wallace, Amanda Randolph, Bill “Basement” Brown. And… 4) A cool Theater Trailer. Do yourself a favor — see this film. It’s available for rental on NETFLIX or Blockbuster, and if you want to own a copy it’s very moderately priced (around $15 or less) at retail outlets such as Amazon.com or Barnes & Noble… and checking ebay, I see used copies for sale at under $5.00. Images and media content are from my personal collection are noted with a “/bb“ at the end of the title when hovering over the image.